Former Prime Minister H.D. Deve Gowda described grandson Prajwal Revanna as a dedicated worker of the JD(S). Bengaluru: Former Prime Minister H.D. Deve Gowda is handing over his Lok Sabha pocket borough, Hassan, to grandson Prajwal Revanna, paving the way for his family’s third generation to enter active politics. Prajwal is the son of Janata Dal (Secular) chief Deve Gowda’s eldest son H.D. Revanna, the current Karnataka PWD minister. His nomination from Hassan is being seen as Deve Gowda’s attempt to address Revanna’s alleged resentment against younger brother H.D. Kumaraswamy, the current Karnataka chief minister, for “sidelining” Prajwal. Described by Deve Gowda as a dedicated party worker, Prajwal was said to have been quite upset with uncle Kumaraswamy for not giving him a ticket for this year’s Karnataka assembly election. Revanna’s wife Bhavani, a JD(S) zila parishad member and a favourite of Gowda senior, sources said, had sent strong signals that Prajwal be adequately compensated for being disregarded by Kumaraswamy. “I have worked for the people for the last 58 years, but I am unable to go on due to my health,” he added. “He has been trying to keep the family together and ensure that their internal squabbles do not affect the image of the party,” a JD(S) member from Hassan told ThePrint. Prajwal, the member said, “has been working with the local leader for many years now and he has the support of the people in Hassan”. “He is just like his father, a grassroots worker and that has helped him connect with his voters,” the leader added. The 2019 Lok Sabha election is likely to see another third-generation Gowda enter the political fray as well, Kumaraswamy’s son Nikhil, who will possibly be offered either the Mysore or Ramanagara constituency. Nikhil has been seen actively canvassing across the Old Mysuru region, which is also a Gowda family stronghold. It is widely believed that Prajwal and Nikhil’s nominations will play out as a contest to determine the “perfect heir” to the party. However, the former PM is not bowing out of the race altogether. Speculation is rife that Deve Gowda will contest the Lok Sabha election from either the Mandya or Bangalore North seat, where votes of the Vokkaligas, the Gowdas’ community, are decisive. Sources close to Deve Gowda say that his heart is set on Mandya. “Shivarame Gowda, who won the Mandya Lok Sabha bypoll, was given a clear indication that this would be his only chance for a ticket,” said a source. “This has cleared the way for Deve Gowda to contest from that seat. Also, Mandya being a farmer’s belt, it will be a sureshot win for the Vokkaliga mass leader,” the source added. Deve Gowda himself has given no indication yet as to which seat he will contest from. The Congress and the JD(S), which came together for an unlikely alliance after the Karnataka election threw up a fractured mandate this May, have also announced a tie-up for the 2019 Lok Sabha polls. JD(S) national spokesperson Kunwar Danish Ali told The Print that decisions about seat distribution will be taken at the party’s national executive committee meeting, which is scheduled for January. “The party will take a call on Deve Gowda’s seat,” said Ali. “We will also decide which seats are allotted to our party. The final decision on the seats for JD(S) candidates rests on that,” he added. Sources in the JD(S) say party elders are lobbying hard with the Congress to leave Bangalore North for the party as part of their seat-sharing deal, which is expected to give the JD(S) 12 of the state’s 28 Lok Sabha constituencies. Talking to the media, Deve Gowda expressed confidence about arriving at a consensus with the Congress. The list will be finalised in a smooth manner without “any hurdle, by 15 January”, he said. With opposition parties, including JD(S) ally Congress, trying to stitch together the Mahagathbandhan, Deve Gowda is said to be harbouring fresh hopes of a second stint as Prime Minister. But political observers described the possibility as a dim one. “He may become the real accidental Prime Minister once again,” said political analyst Muzaffar Assadi. 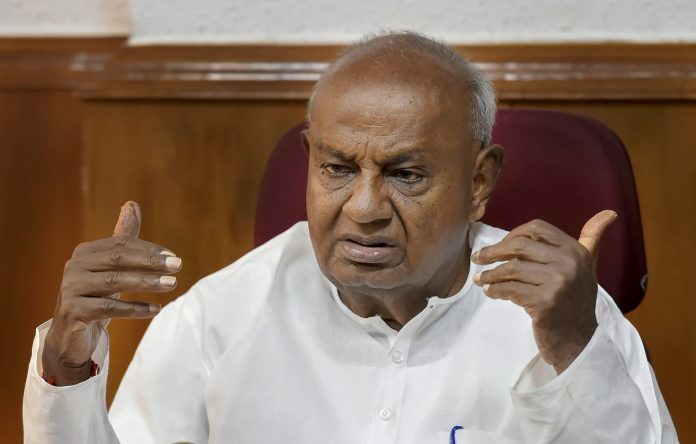 Deve Gowda had landed his less-than-a-year-long stint as Prime Minister from 1996 to 1997 at the head of a coalition of regional parties, United Front, after many other candidates refused the offer or were vetoed. Assadi said the JD(S) will not have any bargaining power this time, given the fact that Congress president Rahul Gandhi is becoming more popular and the anti-Narendra Modi votes will go to the Congress and not the regional parties.